I haven't tried that but it would be cool. The main problem is that I usually use my loadbox and since I only have on of those I don't think I could make that work without blowing up an amp. It seems like the 6505 has more forward mids in this video and the 6505 has a bigger and slightly more scooped sound. In my experience, having owned both a 6505+ and a regular 6505, no video really captures the difference, including this one. I started out with a 6505+, and eventually modded the lead channel to original 5150/6505 specs. The amount of available low-end I suddenly had on-tap was jaw-dropping. The first time I cranked it up, it was an intensely amazing experience, and exactly what I was looking for in tone and feel. Some would definitely prefer the 6505+ circuit, as it is definitely tighter and more clinical. I like an amp to feel on the verge of "loose" and rely on my picking and muting to make it sound tight. I eventually bought a real 120-watt 6505 head and had it alongside the 6505+ for a couple years. The real-deal had even a tad MORE low-end on tap, but that could have been due to my 6505+ being made from the 112 combo, converted into a head, which was only 60 watts. I will say that the 6505+ circuit and 5150 III sound quite a bit better at lower volumes. But the original 5150/6505, when turned up a bit is the most brutal of them all. TheWarAgainstTime, Guitarjon and jc986 like this. I'd say go for something else, Mesa Mini Rectifier, then you can blend both. Maybe I am in the minority but for recording purposes I think 6505mh is quite good for getting that tone. So go for something different. Elric, LiveOVErdrive and Guitarjon like this. Man, I'd love a mini recto but I already own a Dual Rectifier (3 ch version). I agree with you though, the MH sounds freakin' stellar!! Did he buy a 5150 yet? WarMachine and TheWarAgainstTime like this. Guitarjon and KailM like this. budda, Guitarjon, rexbinary and 1 other person like this. Lol, well I already own that 6505MH and a 5150 III EL34 so I'm not in a rush. But I'm definitely planning on getting a big 6505 as soon as I can. I tried band volume with my MH last night against a Diavlo 45 and drummer and it COULD NOT HANG thru my Mesa OS 4x12 lol. So I hit the speaker defeat and plugged it back into my loop switcher and rm100. It's great as an extra channel into that or my Peavey Ultra. Guitarjon, AkiraSpectrum and LeftOurEyes like this. Sell MH, buy 5150, enjoy life. WarMachine, rexbinary, Guitarjon and 1 other person like this. 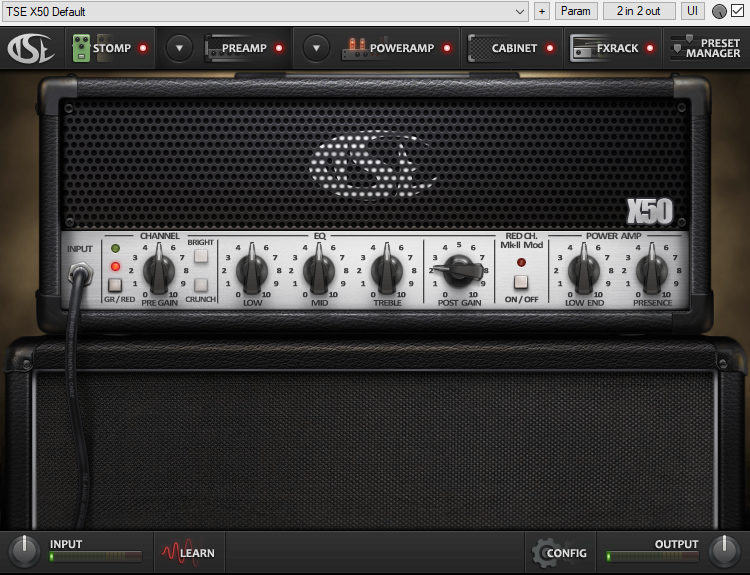 Try the TSE X50 plugin. It's a 5150 sim that lets you choose between the 5150 and 5150II. See which one you prefer. WarMachine and Guitarjon like this. I don't want to sell the MH tbh, it's really good. I have that plugin but I don't recall being able to choose between the I and II. Has that option been added in a recent update? It was on every version IIRC. On the pre-release free version, it was a switch that was labelled Red Ch Mode that switches between the Peavey 5150 and 5150II (MK1 and MKII) that you get by going to the back of the "amp" by pressing the View button. On the actual retail release, it's a button on the front of the amp that says "Red Ch. Mark II Mod"
Between the Post Gain and Low End knobs. I've had and used TSE X50 for a few years now and still come back to it from time to time. I can honestly say its VERY close to the 5150 Sig i still have. I had a recording about 2 years ago where i ran just the preamp section through my interface then with an IR inside of reaper vs vst's. Wish i could find it the margin was VERY small. I've been on an Overloud TH-U kick lately. I think it sounds very authentic for the 5150 and bass tones at the very least. I'd say i dig the TSE a bit more if it came loaded with all the bells and whistles that TH-U comes with. But yeah, like budda has said, 5150 and call it a day. I think I have it installed, but I prefer to go with Nick Crow's take on the 5150/6505, although in general I am not that crazy about these sounds, I prefer boosted Marshall or Mesa sims or live rigs.